Voting for the 2017 Motif Theater Awards ends Thursday, August 3. Click here to access the information and ballot. 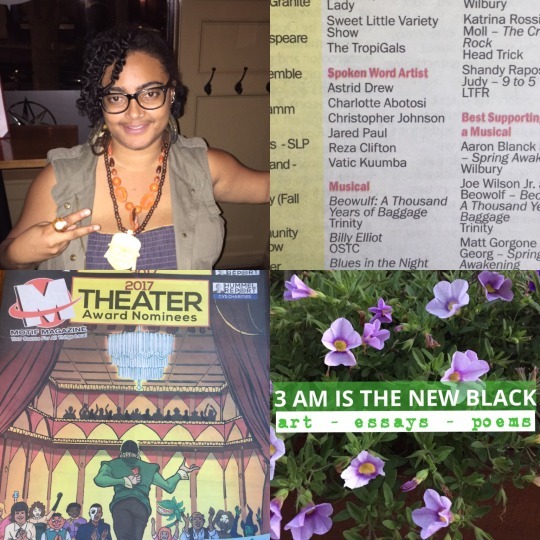 PROVIDENCE, RI – Hi friends, crazy awesome news happening here in the universe of Venus Sings, 3 AM IS THE NEW BLACK and the #AmbitiousBlackFeminst: Yours truly, Reza Rites, has been nominated for a 2017 Motif Theater Award. As I’ve told some folks recently, this was already feeling like a good year in poetry for me. From performing at the RI site of the Women’s March on Washington, participating in the 30 Poems in 30 Days meditation, creating “I Am Salt Water: Honoring the Sacred Motions of Gaia LaVonne Gallactica” an interactive performance art piece and theological fantasy story built off of my poetry, and creating a manuscript tentatively called “Planet Love” which was inspired by a performance curated by Roz Raskins of Roz and the Rice Cakes, I was already feeling positive about my progress as a poet. After all of that, to then get the news from fellow nominee Vatic Kuumba that I was among those being considered for a Spoken Word recognition – well it truly served as a certain type of icing on top. Thanks for all the support over the years; support for this effort expires Thursday, August 3, 2017, while the event where winners are announced happens Sunday, August 13. To see the other nominees, to find info on voting, and for details on the August 13 event, click here. To see video footage from my Women’s Rally performance, click here. To learn more about “I Am Salt Water,” see a short teaser and trailer here. To view and follow my art, essays and poems, visit @3amblack on Facebook, Twitter and Instagram. To be in touch about ways to access projects and performances ready for the public or to book me, email rezaclif@gmail.com or message me on Twitter or Facebook @3amblack or @rezaclif.